1. 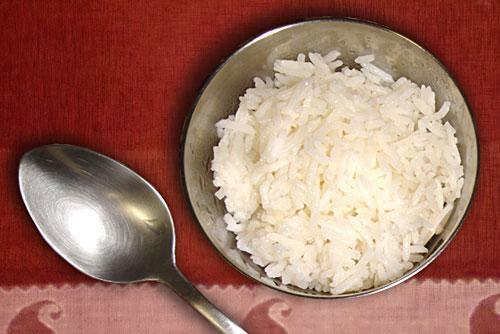 Place the uncooked rice in a sieve and wash thoroughly under cool water until water runs clean. (Rice and some other grains are often not pre-washed before they are sold so it is always a good idea to rinse a few times before using). Set washed rice to the side to drain a little. 2. In a saucepan melt the ghee on medium heat until liquefied and hot. Add the drained, washed rice and stir gently. Fry the rice for a couple minutes evenly coating all the grains and stirring gently to prevent sticking. Add the water, salt and pepper, and then bring to a boil uncovered. 3. Once the water is boiling, reduce the heat to low and cover with lid. Cook for approx 15 minutes, or until all the water is gone. Since you don't want to stir or disturb the rice until it's completely done cooking, it's easiest to test the rice's "done-ness" by slipping a butter knife down the inside of the pot and opening a small gap to peek down to the bottom of the pot to check for any remaining water. Turn off the stove and let the rice sit for 5 minutes covered. Fluff with a fork, offer and serve. Note: If your cooked rice is too sticky, try adding a little less water next time. For undercooked or unevenly cooked rice, ensure that you turn the heat to low as soon as the water begins to boil and cover tightly so that the steam has enough time to cook the rice thoroughly.